I’ve been in bed for the past 34 hours and let me tell you it’s been [mostly] glorious. Before we get all judge-y, I had minor gum tissue graft surgery yesterday because my genetics are all screwed up (thanks Mom and Dad! ), which has landed me in this position of acceptable laziness. I won’t get into all the fun details of the procedure – Google can do that for you if you’re that interested – but now I’m propped up in bed for the weekend with one puffy cheek, catching up on every episode of Suits I can get my hands on, doing homework and eating baby food when I’m not in too much pain. Considering how crazy my schedule has been for the past few months, this is kind of like a vacation for me. I don’t think I’ve slept this much since 2006. By the way Mom and Dad, I know it isn’t totally your fault. XO. When the body goes through a traumatic event such as surgery, it needs rest and nutrition to heal properly. I’ve got the rest part down, but the nutrition part has been a little more difficult for me. I’m on my periodontist’s orders not to eat any solids for at least 3 days. Bah. I get grumpy when I can’t eat food. Determined not to succumb to a weekend of coconut ice cream and fruit smoothies (can you say sugar high? 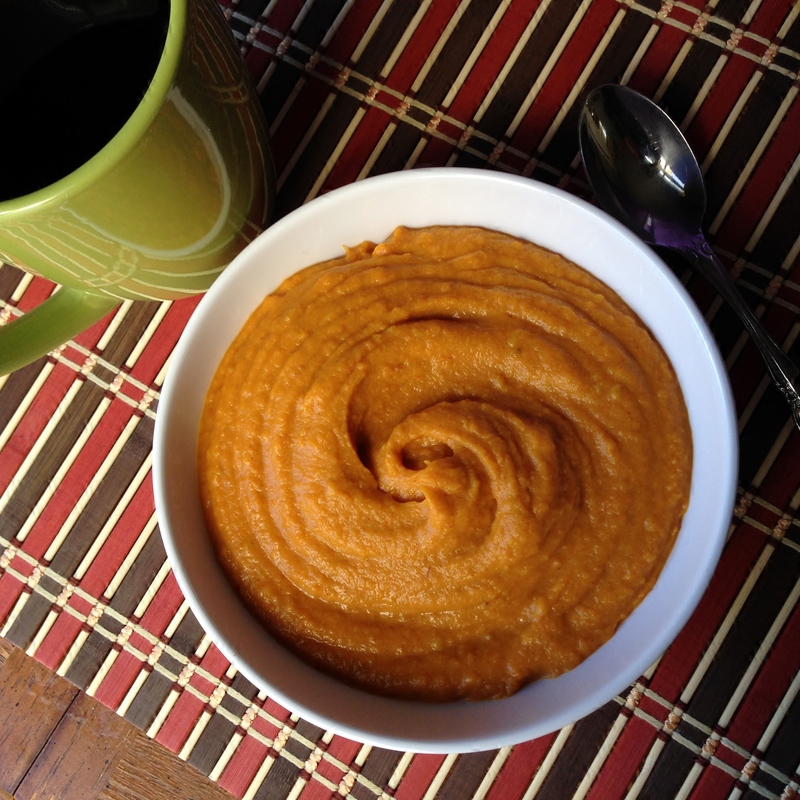 ), I asked my Facebook followers for a few suggestions on puréed soups. After receiving some good tips and considering the contents of my refrigerator and pantry, I decided to go for a curried sweet potato and apple soup. I can’t tell you how badly I wanted to throw bacon in this soup, but I was all out, and driving while on Norco is not recommended. I’ll survive. Unfortunately, I had to let this sit in the fridge overnight because my mouth and my stomach weren’t exactly on the same page yesterday. Attempting to eat was awkward and painful. So I lived on TJ’s apple cider yesterday and waited patiently until this morning to give it a go. This soup really developed overnight and was amazing reheated. Creamy and comforting, with warm spices to keep the flavor meter up high. This whole surgery thing isn’t half bad! (I didn’t measure the servings on this one. I blame the drugs. I think it made approximately 4 cups). Peel the sweet potatoes and apple and cut into large chunks, then cut the carrots in half. Add these to a boiling saucepan of water and boil until soft, about 8-10 minutes. When tender, remove the saucepan from the heat, drain the water and add to the food processor with the coconut milk. Let the food processor whirl for a minute or two, until all produce has been completely puréed. No chunks! Transfer the puree back to the saucepan and add the chicken broth, apple cider and spices. Is your mouth watering yet? Mix in these remaining ingredients and let simmer on low for about 20 minutes. Top with bacon or chopped nuts for a treat. Please remember to use the cream at the top of the canned coconut milk when cooking, and use full fat. As mentioned above, this reheats wonderfully. Not going to lie, I even liked it cold! Okay back to bed for this puffy cheeked gal. And remember, stay hungry my friends!